The names of hundreds of thousands of Holocaust-era life insurance policy holders have been published on a website on Wednesday in an effort to locate beneficiaries. 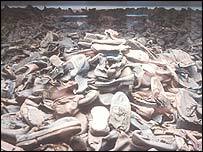 The International Commission of Holocaust-Era Insurance Claims was set up in late 1998 after complaints that insurers were stalling on insurance claims or setting unreasonable standards of documentation. But now more than 363,000 names have been provided by German insurance companies after a landmark agreement last September in which insurers agreed to pay $100m in claims and $175m to Jewish charities. The names were gathered by comparing lists of German Jews with insurance policies sold before World War II. To those names will be added a further 16,000 the commission gathered through its own trawling of insurance archives. "This is the biggest step that has ever been taken as far as making Holocaust-era insurance policies available to the public," said Dale Franklin, the commission's staff director. "No list of this magnitude and size has ever been published." It is unclear how many people will benefit from the release of the names, as some families have already received payments through 1950s and 1960s restitution programmes. It is also unknown how many people on the list were victims of the Holocaust. Families of unpaid policy holders and survivors have until September 2003 to file claims. Claims may also be made on dowry, education or pension insurance. The United States has said it will then try to provide German insurers with immunity from future lawsuits in the US on claims from the era. Standards of proof of possession of policies have been relaxed in recognition of the chaos and devastation wrought by WWII, in which documents may have been lost, and which may have resulted in long periods of time elapsing before compensation was sought. Mr Franklin said payouts to claimants were likely to be speeded up because the entire German insurance industry was now involved in the settlement. "Previously there were only about five companies that were participating along with the Dutch insurance association and a number of other institutions. "So this brings in a large portion of the insurance market from the Second World War era," he said. The companies' names have not been released.